Spring winds sometimes push me and my bike in unexpected directions. That has been especially true this Spring. I am excited to announce that I have taken a position at Cascade Bicycle Club as the volunteer coordinator. It is an exciting shift for me. This also means I am taking a hiatus from teaching my weekly yoga classes. But this doesn’t mean that Pedal, Stretch, Breathe events are over! 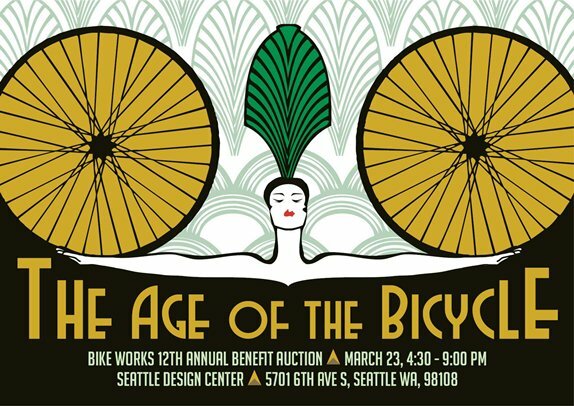 Recently, I’ve been dedicating a lot of my time on the Bike Works Auction that is this Sunday March 23rd. There are still a few tickets for sale if you want to attend. I’d love to see y ou there. Two of my favorite annual events Pedaler’s Fair and the Alley Cat Acres Streets & Beets ride have both moved to May. Pedaler’s Fair is a great market full of bicycle inspired businesses. You can find incredible handmade goods there. Registration is now open for the fantastic fundraising ride for Alley Cat Acres. I’ve written about previous years here. I’ll be at both events doing yoga for the every day bike rider workshops and answering people’s questions about what stretches help sore upper backs and tight legs. We will also go over how to integrate yoga into your commute. At Pedaler’s Fair you will have the chance to buy my book and other goodies published by Taking the Lane. 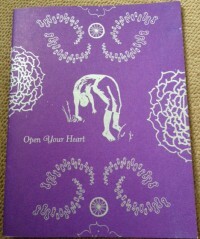 Recently I have been really inspired to slow down both on the mat and on my bicycle. When you slow down you have greater awareness of your body and what is happening around you. Sometimes I feel like a nag when mutter from my bike, “slow down” to speedy passers by who aren’t paying much attention. In my classes I remind people to “take child’s pose” or “just rest” throughout class. I remind you all to slow down as a method to remind myself. We hurry a lot. I say this as a chronic over-scheduler who loves to take on multiple projects. This pattern of stress-out then burn-out is one I am trying hard to break. Taking time to relax, not be rushed and rest are important for breaking that cycle. Working hard (physically and/ or mentally) is no doubt good for you, but it is important to balance out hard work with recovery time. The most basic way to recover is to take a nap or go to bed. Refresh your brain and your body with sleep. 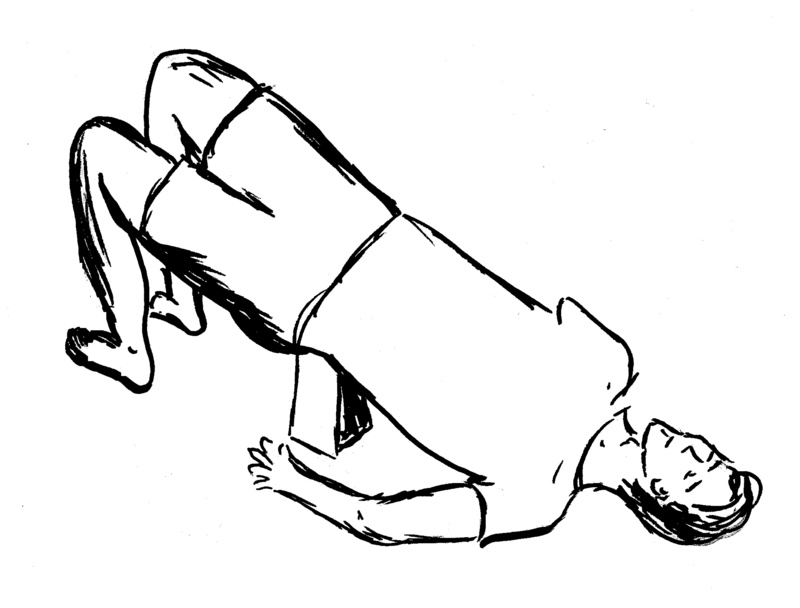 Release the front of your body with supported bridge pose. Or try gentle yoga poses. Some of my favorite poses are supported with the ground, wall, bolsters, even your bed. If you want to focus on a gentler practice please join me for the Lullaby class over at The Grinning Yogi where we will slow down, stretch out and take time to breathe. Lullaby Class @ The Grinning Yogi on Wednesdays 9pm – 10 pm. If you mention my blog at the event I will give you a free sticker…and you better believe I have a great selection. Remember if you don’t make it to the Craft Fair, you can order my book online here and I will happily send you a copy snail mail style! Happy spend today at work shopping online day! In an effort to bring the virtual world back down to the real world I’d like to offer a special for my friends in Seattle: Bike Delivered Gifts. 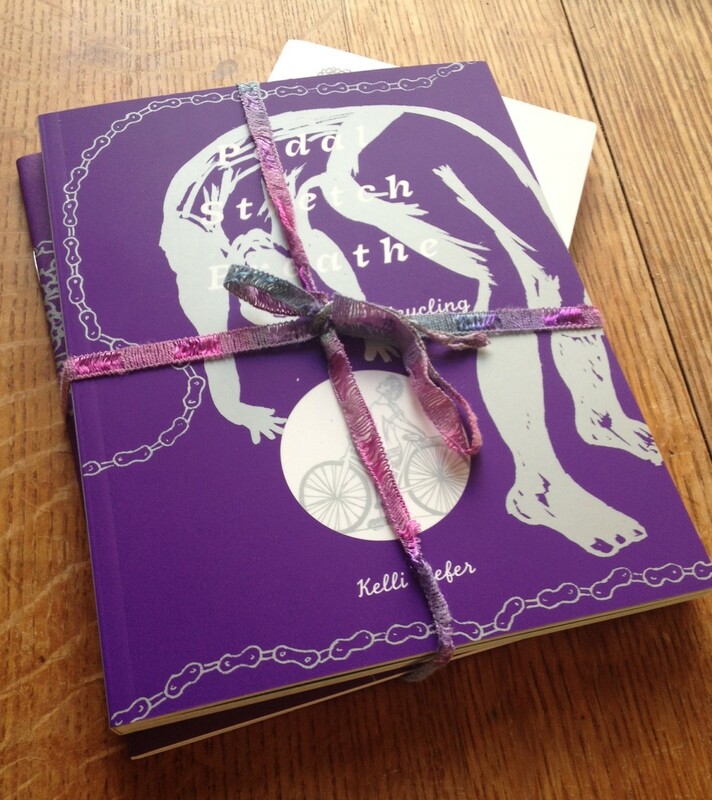 If you order a copy of Pedal, Stretch, Breathe: The Yoga of Bicycling or better yet the NEW Gift Bundle I will bike it to your home or workplace all wrapped up in ribbon just for you! Offer is available if you order online before 12/18 and live or work in Seattle. For my friends outside of the city I will happily mail you a copy. Thank you for choosing to support independent artists and makers this holiday season. Can you build community through buying stuff by bicycle? Oh the juicy world of economics. I dabbled a bit in college by taking classes on feminist economics and Marxism. I am no expert, but I am fascinated by the economic impacts of bicycling. Recently I’ve been reading Elly Blue’s new book Bikenomics. I am more aware of how my bicycle lifestyle shapes my spending habits. But even more than that, I’ve been interested in how biking to businesses builds community. Aside from the folks who totally live off the grid and dumpster dive for all the basic necessities, the rest of us buy stuff. The choices we make about where we buy stuff and who we buy it from carry all of these unintended consequences, that can be for better or worse. When we buy stuff at big box stores a large chunk of our money immediately leaves the city. However if you shop locally more of your money is recirculated in the city, enriching your neighbors. I realized that know a lot of business owners around town. In many cases I’ve been connected through business owners because their business is bike related. 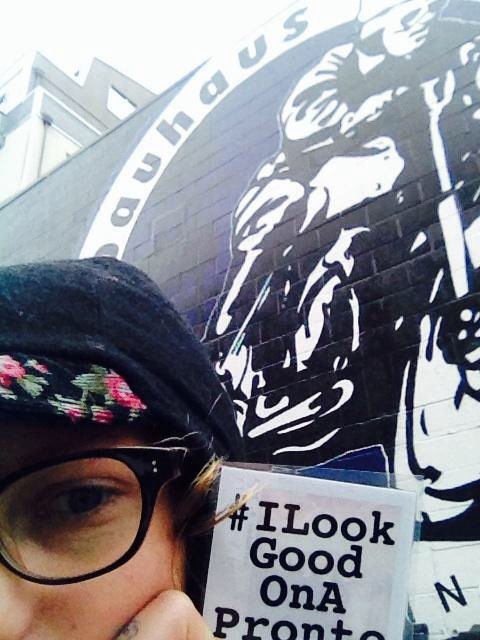 Going to the Seattle Bicycle Expo a few years ago, I met Martina of Swift Industries. I fell totally in love with her bags and as it turns out we are actually neighbors. Not only do you have the chance to support people making great products you may end up making friends. Bicycle Benefits is another great way to discover new business and get discounts to places just for riding your bike there. A few of my favorite bicycle benefit deals are the $2 Theo Chocolate Bar, the 2 for 1 tickets at Central Cinema and 50% off your drink when it is raining at Asgard. That is one sweet date night, all pedal powered. Supporting local business is an important rejection of corporate chains and mass produced crap. Local business fuels people’s creativity and passion. You see that in folks who have recently started incredible business like Peddler’s Brewing or G & O Family Cyclery. These folks are inspired by the power of bicycling and they have created a space for community to develop. Every time I go to G & O I run into someone who I love seeing. Every time I am at Peddler’s I meet new people to swap bike stories with over a beer. G&O will be closed this Thursday and Friday for Thnksgvng and Buy Nothing Day! We will reopen for Small Business Saturday. See you then! As we enter the crazy holiday shopping season remember, you can skip Black Friday (like G & O is bravely doing). Instead grab your bicycle and head out for Small business Saturday. Also, remember to check out local craft fairs. I’ll be at the Hangover Flea Market/ ArtAche Market this Sunday 1-6pm at Chop Suey. I’ll be selling books, journals, cards and some sweet goodies from Taking The Lane. I even have some copies of Bikenomics, you can pick up a copy and then we can talk about how bicycles will save the economy over a cup of coffee at El Portal, a bike friendly local coffee shop! There are some really wonderful ways to have fun and give back in both the world of bicycles and yoga. I wanted to share with you two of my favorite events that help bring food and peace of mind to those in need. Please consider jumping on your bicycle and pulling out your yoga mat for a good cause. A food drive scavenger hunt by bike, Cranksgiving is a fun way to tour some of Seattle’s most unique grocery stores and food stands, gathering food for Rainier Valley Food Bank. We give you a list of food and grocers, and you gather as much as you can before time runs out. You get points for each item and each grocer, plus points for other bonus challenges. All the food will be donated immediately at the finish line. Meet at 10:30 a.m. in Gas Works Park. The ride ends in Columbia City with an after-party at Ark Lodge Cinemas. Grab Your Mat and Pedal to one of the many Gratitude in Motion Yoga Classes! Every year hundreds of yogis (you!) and more than 20 yoga studios around the Puget Sound dedicate their practice to Yoga Behind Bars on or around Thanksgiving Day. The goal: to raise critical funds for our programs for young people and adults in prisons. Our goal this year is to raise $13,500 to support our yoga and meditation classes at places such as Echo Glen Children’s Center and new ones at Mission Creek Corrections Center for Women. Yoga Behind Bars is one of my favorite Non-Profit Organizations in Seattle because the work they do is so important for all of the incarcerated people. It is no secret that our current rates of incarceration are completely unacceptable. People need the practices of yoga and meditation to help them relax in an incredibly tense and stressful environment. Yoga is a powerful tool of transformation, as many of you know from your personal practice. Please go to your mats to give back! It is easy. You will feel better and so will someone else!